Teams expect to see early returns from their early-round picks as rookies, while late-rounders and undrafted players usually receive a pass for at least their rookie campaigns. However, some of the draft’s castaways make an immediate impact at the NFL level. This is a list of those guys. Sixth-round Virginia State product Trenton Cannon has played just 13 offensive snaps this season, but he’s made the most of his 37 special teams snaps. He has played at least seven special teams snaps in four separate units and earned a 71.1 overall grade in the process. Unfortunately for the Patriots’ late-round star, Ja’Whaun Bentley can’t build on his stellar start to his rookie campaign, as he will spend the rest of it on the Injured Reserve with torn biceps. Before bad news struck, however, the former Purdue linebacker earned an 81.7 overall and 84.5 coverage grades – an early sign that Bentley has a bright future ahead in Foxborough. Stepping in as the Bills’ primary slot cornerback, Weber State alumnus Taron Johnson has performed well on the big stage. He earned 77.0-plus overall grades in Weeks 4 & 5, and he ranks inside the top-20 in yards allowed per coverage snap (1.03) among qualifying slot cornerbacks. Stowed behind the likes of Frank Gore and Kenyan Drake, former Arizona State running back Kalen Ballage has just three offensive snaps this season. He has, however, made a positive impact on special teams, earning a 70.7 overall grade across 33 special teams snaps. Making his way onto the field will take time, but yielding positive results in the game’s third phase is always a strong way to start as a rookie pushing for playing time. With injuries to Giovani Bernard and Joe Mixon, former Miami (Fla.) running back Mark Walton has played 47 offensive snaps in Weeks 3-5. He has just five carries for nine yards in said span, but he did flash his pass-catching ability on a 24-yard reception against Atlanta in Week 4 and has slowly started to adjust to the speed of the NFL. He’s also the only Bengals late-rounder to qualify, so that helps his case. 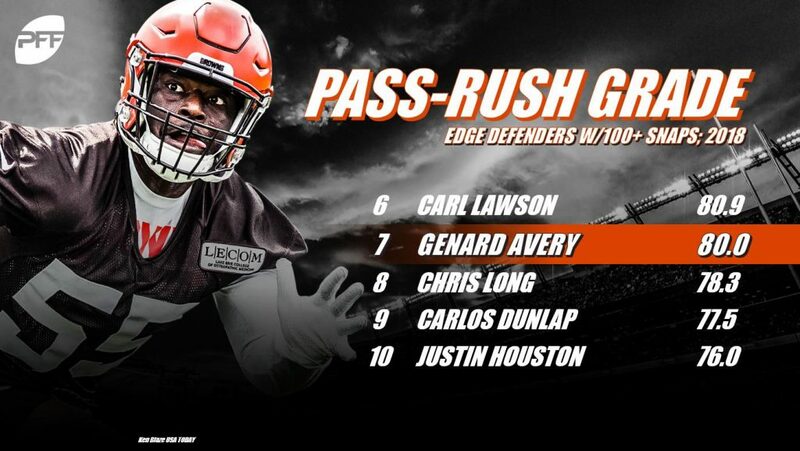 Former Memphis standout Genard Avery was on pace for Defensive Rookie of the Year to start the season with his 90.3 overall grade in Week 1. 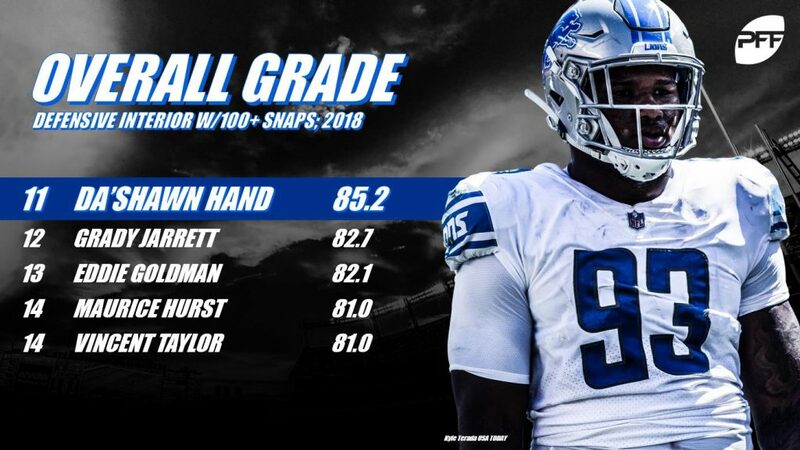 And though he’s settled down a bit since, Avery still owns an 80.0 overall grade and an even more impressive 80.0 pass-rush grade so far this season. He has recorded multiple pressures in four of five games, as well. Kenny Young has undoubtedly struggled as a primary piece to the Ravens’ defense, earning just a 58.2 overall grade across 170 defensive snaps. However, the experience he’s gaining will benefit him long term, and the high-end potential he has flashed in bursts is promising for the young buck’s future. He currently ranks fourth among all rookie defenders in defensive stops (15). Undrafted Florida State linebacker Matthew Thomas, a former five-star recruit coming out of Miami (Fla.) in 2013, recorded one defensive stop in his four defensive snaps in Week 5 and may be in line for more defensive snaps in the near future. He has also contributed significantly on special teams, playing 50 total snaps across three separate units and recording three tackles. The Colts selected the former NC State standout Nyheim Hines in the fourth round of the 2018 NFL draft. Hines was heralded as one of the nation’s top all-purpose backs heading in the NFL draft, so it’s no surprise that he has excelled as a pass catcher for the Colts. He has 29 receptions this season, which ranks as the fourth-most among running backs, with 13 of those receptions resulting in a first down, which also ranks fourth among running backs. Former Texas Tech wide receiver Keke Coutee has come alive in recent weeks, catching 17-of-20 targets for 160 yards and a score in Weeks 4 & 5. The 5-foot-11, 180-pound wideout rebounded after two early drops in Week 4 to become a reliable target for Deshaun Watson with great yards-after-the-catch ability. Undrafted Temple edge defender Sharif Finch has quietly turned in quality performances with Tennessee in his limited role on the defense, as he’s recorded three total pressures and one defensive stop in just 41 defensive snaps. Seventh-round punter Logan Cooke has been one of the worst punters in the NFL in nearly every metric, and none of the other Jaguars’ late-rounders have played enough snaps to qualify. Tre Herndon hasn’t blown the doors off Jacksonville with his special teams play, but he does lead all rookies with 68 special teams snaps and has recorded three tackles through Week 5.
Credit Broncos general manager John Elway for his efforts in the later rounds of this year’s draft, as he has seen positive returns from multiple late-round and undrafted rookies in this season, including running back Phillip Lindsay (undrafted) and wide receiver DaeSean Hamilton (fourth round). Former Iowa linebacker Josey Jewell, however, gets the nod for this list. 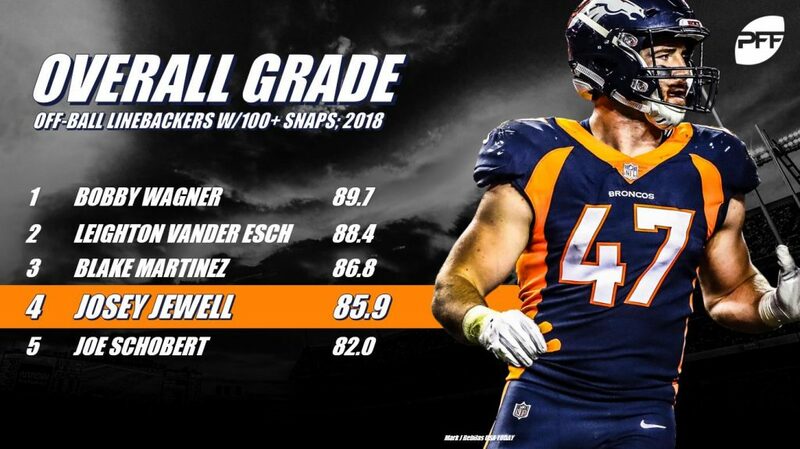 The 6-foot-2, 236-pound Jewell has earned the fifth-highest overall grade (85.9) among all rookies – not just the castaways picked up on Day 3 and after the draft. He has thrived in rotation the Broncos’ starters at off-ball linebacker and looks to be making a case for a starting spot. He also leads all rookies in special teams snaps (131) through Week 5. Chiefs rookie safety Armani Watts turned in abysmal performances in across limited snaps Weeks 2 & 3, but he has since rebounded in his expanded role. Playing 35 defensive snaps in Weeks 4 & 5, Watts earned 77.0 and 72.0 overall grades, respectively. While he has experienced some growing pains in Los Angeles, rookie safety Kyzir White has avoided a disastrous start despite taking a trial-by-fire approach to his rookie season. Prior to going down with a knee injury in the Thursday practice prior to Week 4, White earned a respectable 65.6 overall grade across his 142 defensive snaps. Slotted as the No. 3 overall player on our final big board, Maurice Hurst’s strong play out of the gates comes as no surprise. 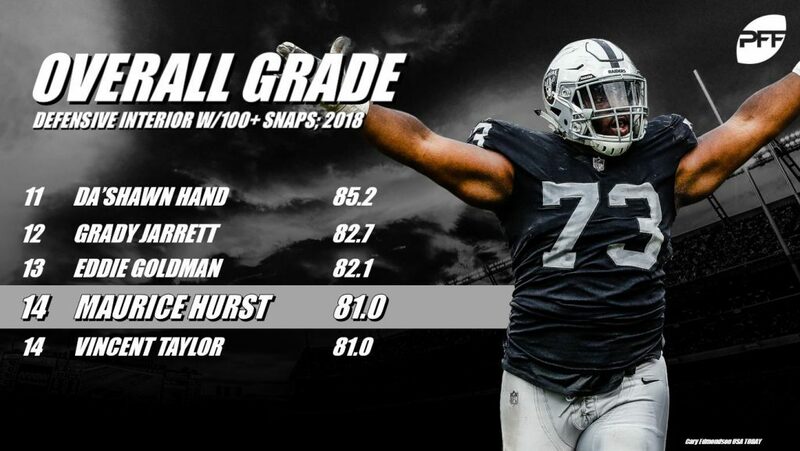 Hurst leads all Raiders defenders with at least 10 defensive snaps in overall grade (81.0), and he’s already recorded nine defensive stops and seven total pressures across his 191 defensive snaps. Former Kansas edge defender Dorance Armstrong struggled out of the gate a bit, but he’s just now starting to gain momentum. He has recorded six total pressures and two defensive stops in Weeks 2-5 and hasn’t missed a tackle since Week 1. While he’s played just one defensive snap so far this season, Washington’s Danny Johnson has provided quite versatile on special teams. He has played at least 12 snaps on four separate special teams units and missed zero tackles in the process. Avonte Maddox has flashed at times on special teams while turning a 47.6 overall grade across his 82 defensive snaps. Most recently, Maddox earned a 52.8 overall grade across 62 defensive snaps against the Vikings in Week 5. The former Pittsburgh safety didn’t leap off the stat sheet, but he didn’t allow any receptions as the primary coverage defender and showed some signs that he could start to trend upward with more experience. Undrafted rookie cornerback Sean Chandler has been a man among boys on special teams, earning the second-highest overall grade (82.2) among all rookies. He has also played a whopping 71 special teams snaps across multiple units, proving to be a valuable Swiss army knife for the Giants. In addition to playing 42 special teams snaps, Tyler Conklin has 42 offensive snaps for the Vikings through Week 5. He has impressed in pass protection (70.9) pass-block grade and caught both of his targets for 13 yards and a first down. Punters are people, too. And Packers rookie punter J.K. Scott is among the league’s best punters so far this season, as he leads all rookies and fifth among all punters in overall grade (73.6) through Week 5. Former Alabama standout Da’Shawn Hand has picked up where he left off in Tuscaloosa, taking his special run-defense to Detroit. His 77.1 run-defense grade ranks seventh among all rookie defenders through five weeks. Former Delaware product Bilal Nichols has played just 50 defensive snaps this season, but his play has been special in the limited sample size. He has recorded an impressive 86.9 overall grade through Week 5, logging two pressures and three defensive stops in the process. Ito Smith hasn’t played a ton for the Falcons (71 offensive snaps), but his play even in limited fashion has been strong. He hasn’t allowed a pressure in his 16 pass-block snaps, and he’s caught all eight of his catchable targets through Week 5. He continues to improve and provide value in a backfield that is struggling in wake of Deonvta Freeman’s injuries. Bucs’ Jordan Whitehead, a fourth-round safety product out of Pittsburgh, played well for Tampa Bay before going down with an injury. He recorded eight combined tackles while missing zero, and he allowed just two receptions for 37 yards in coverage. After being a full participant in practice Wednesday, Whitehead should pick up where he left off in Week 6. Taylor Stallworth is the only late-round rookie that has played at least 40 offensive or defensive snaps for New Orleans so far this season, and he impressed in a limited role in the Saints’ defense. He has recorded one pressure and one defensive stop in his 96 defensive snaps. Ian Thomas’ 45.8 overall grade doesn’t look great, but he is the only Panthers’ late-round rookie to play at least 40 defensive snaps this season. He has, however, impressed in pass protection (75.5 pass-block grade) across a limited sample size (11 pass-block snaps). The early experience is good for Thomas’ development, but he’ll need to turn things around in a hurry, specifically in the passing game, if he’s going to really be a high-end contributor rather than the team’s only qualifying rookie. Running back Chase Edmonds almost stole this spot away from Cardinals’ Zeke Turner, but the former Washington linebacker has played too well on special teams overlook him at this point. Turner’s 79.0 overall grade across 84 special teams snaps ranks fifth among all rookies so far this season. After his three-reception, 105-yard performance in Week 2, rookie tight end Will Dissly has (expectedly) fallen back down to Earth. However, his fall hasn’t been as significant as you’d expect with a fourth-round blocking tight end, as he currently owns a 71.4 overall grade and a 75.2 pass-block grade. D.J. Reed is the only rookie on the 49ers’ roster drafted outside of the third round that has played any special teams snaps or defensive snaps, making him the top choice by default, unfortunately. He has earned one of the lowest grades as a special teamer (29.9) and just a 52.2 overall grade across his 119 defensive snaps. He has also missed three tackles already. Los Angeles entered the 2018 season with a desperate need for someone to step along the edge of its defensive line, and fourth-round rookie John Franklin-Myers has done just that. His eight total pressures rank T-fifth among all rookie defenders through five weeks.